Egypt completed dredging for the new shipping route in the Suez Canal, which will be inaugurated on August 6th, according to a report from the armed forces published by Aswat Masriya on Thursday. This marks the dredging of a total of 250 million square metres and the digging of 70 million square metres in the expansion of the Ballah Bypass. The Bypass's width is now 312 metres, compared to the previous 61 metres. The flagship project of President Abdel-Fattah El-Sisi's economic programme is set to open in August and will be attended by world leaders. The government will fund the opening ceremony of the new waterway through donations from the public and contributions from participating dredging companies to avoid any burdens on the state budget, the head of the Suez Canal Authority, Mohab Mamesh, said last month. Since taking office in June of last year, El-Sisi has embarked on an economic reform programme, restructuring the state budget in an effort to trim a ballooning deficit. The mega-project to expand the Suez Canal, alongside plans to build an industrial hub and a supplies and logistics centre in the vicinity of the canal, are at the heart of El-Sisi's development plans. The terrorists and their supporters are not fighting us for Allah (SWT); but to take a piece of the Canal and control it. 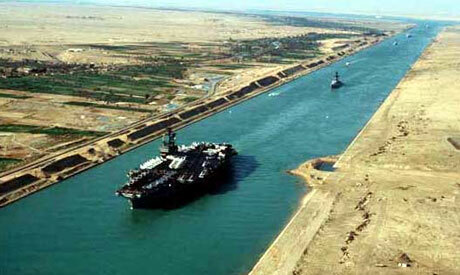 Who will benefit: Iran, Israel, Pals, USA,... Egypt full control of the canal is power and money for Egypt only. Let us support our leaders to crush those evil forces. wE SAHOULD GIVE THEM SOME We should give our heroes some stocks in Suez Canal. they put their life on line to defend it. Tahya Misr. We need a new mega-project. The Qattara depression project is highly lucrative and we can immediately start work on it by transferring the dredgers which were working in the suez canal. Besides electricity generation, a small city could be built working on agricultural and fish farms which could be built around the lake at the bottom of the depression.